I am a time management machine. I often go to the gym after work or partake in some sporting activity at least a few days a week when I’m not chained to the desk past a reasonable hour. That means, I am ‘Gantt charting’ my dinner by mid afternoon while I am working. I am probably outside that generation accused of shrinking attention spans, chronologically speaking but we are brethren all the same. If I am not multi-tasking, I am doing 1 thing really slowly or poorly. I remember mentioning my penchant to 'project plan' dinner with parallel activities and bottleneck averting actions plans to a young girl in the office a couple of years ago. I explained how I naturally found myself applying project management principles to cooking and she seemed awestruck by the concept. I thought that was adorable. It seemed pretty obvious to me and probably to most of the home cooks out there. That said, I am a Time Management machine. I will take all comers. By mid afternoon or as I am running back to the office with my take-out Sushi for lunch, I have inventoried the fridge in my head and catalogued a short list of dinner options. I eliminate based on my craving and or recent meals. I add ones based cravings as well, then inventory the missing ingredients for pick up on the way home. I am leaving the office on a good day. We are playing golf. I pick a walking route home passed the appropriate market for my selected meal. I have run the subroutine in my head in the background while I am working. I am probably still at 2-3 options. As I run to the home today and decide how many holes we can play before sundown based on my pace. If I go to the gym instead of an outdoor sports activity, I do not shower at the gym because: 1. Ewwww. 2. More time consuming than just whipping stuff on and off at home. 3. Reduces the stuff I have to carry and I’m going to walk home and sweat again anyway. 4. And normally on gym days, the sun is setting and it is not a critical path item. D and I meet at home change and are out the door with the golf gear in under 15 minutes. We go to Musqueam because they do not require booked T times. Well, that was what we thought but we were wrong. They recently changed the policy. No matter. They are not at all busy so they let us walk on. We play holes 1 through 7 then hit a bottleneck of a very slow high maintenance couple in a cart and very fancy golf clothing. All Burberry and slow green clearance. Grrr! Then by hold 9, they are caught behind 3 boys that are caught behind 4 beginner dudes who may as well be playing field hockey down the fairway. We decide to skip holes 8 and 9 and go straight to 10. I did the most amazing thing on this hole. There is a bridge half way down the fairway that crosses a stream. I drive off the tee and my ball bounces off the 2 inch wide metal railing with a loud, reverberating clang and jumps forward 2 ft from the green!!!! Hilarious. It is a relatively small course so it went fast. We finish all 18 holes with holes with the 18th practically in the dark. But ironically, we both had the straightest longest drives and most accurate pitches on to the green of the whole game. Of course, we did not know that until we walked down the fairway to find our balls. I am going to make a Vegetarian Korean Curry. Multi layered dish with different components including the Rice or Grain I will serve with it. I walk through the door. I go straight to the balcony and turn on 2 burners on the BBQ. I place the Vegetable basket on the grill. I wash and chop 1 small Asian Eggplant and ½ small Sweet Potato. I wash 10 Asparagus with the other veg. I fill the Pyrex Glass up to the top of the word Pyrex but 2 ¼ c will do. Microwave for 3 minutes to boil. I go to the other balcony and collect some Cilantro, Parsley and some Purple Basil. I get a small saucepan and measure out 3/4 c Quinoa and 1 ½ c Water and put on high o Boil. Toss the Vegetables on the BBQ (the Eggplant, Chili and Potato). Turn down the Quinoa to a low simmer once it boils for 10-12 minutes and then turn off. Break 4 cubes of Korean Curry sauce. Set aside in the Microwave off to soften. I take out my Pappadums and take two the the BBQ. Think to myself that the Pappadums was a mistake because it brought down the temperature of the BBQ. I set the Pappadums to the side to cool while I take out a bottle of wine from the fridge. I open the laptop in the kitchen and turn it on. I open the wine and munch on the Pappadum and sip the wine while the computer boots up. Tweet my wine selection and call myself a Time Management Machine. I turn off the BBQ as I see the vegetables are roasted enough. They will cook more in the Stew but I like the roasted flavor as well as speeding up the cooking time. Leave them there in the warm grill. I get out a large Wok. Heat on Medium High and add some Vegetable Oil. Stir fry the Onions for 30 sec until Soften. I get the BBQ Vegetables and toss for 15 seconds. I add the Garlic and Ginger. Toss for 15-30 seconds. Take out the Pyrex Glass and stir with a spoon. Keep stirring as you pour into the Wok. You may need another ¼ cup to swirl to get all the bits. Add the Cilantro and Basil, torn. Bring to a hard boil to activate the thickening agent in the Curry cubes. Turn down and simmer for 10 minutes or longer. Serve over Quinoa with Parsley. Eating in front of a DVD by shortly after 9pm because nothing is on and have nothing good saved on the PVR. Shower after eating if I go to the gym. The showering after is efficient on several levels because you will sweat whilst walking home, cooking and eating a curry. As well, you will smell of curry. Warning, this last bit may only be acceptable if your partner is out of town or also thinks showering in the gym is gross. D has learned to live with this. We are done and eating within 30-40 minutes. Ta-da! It was rather chilly tonight, relatively speaking. It dropped below 20C. What better excuse than to make a Risotto. Well, there is that and the fact that we can do it in our sleep which is great when we get back home late. If you are using Frozen Peas, sit them in a bowl of cold water now. Don't nuke them. You want them to have some bite and colour. Get out your favourite Wooden spoon. There is no scientific reason for it as there is in Candy making. In a small sauce pan, heat the Broth. Bring to a boil and then immediately reduce to super low and set aside with your ladle sitting in it. The Crimini Mushrooms or Brown button, they have more flavour, just need a thorough brushing. Slice the very end of the stem off and slice into 1/2 cm. The Portabella Mushrooms are different. Brush the caps thoroughly. Pull the whole stem out. You will not use it. You could save it in the freezer for a Vegetable stock. Now, scoop out all the Gills inside the Cap. You do not have to but they will fall out during cooking and make your dish look 'dirty'. Slice into 3/4 cm slices. In a large pan, heat 1 - 2 T Olive Oil on High. Sautee the Mushrooms until golden brown. 5-10 minutes. Do not move around too much. Let brown on one side before moving. If you move them too soon or too much they'll start to steam. It isn't the end of the world but it will not give you the same round flavour. Set the Mushroom aside on a plate. They usually go on the plate I like to eat off of so I get all the Mushroomy goodness. In the same pan, add 1-2 T Olive Oil on Medium. Sautee the shallot until softened. Add the Rice and ensure that all the grains are coated and glistening. You may need to add a touch more Oil. Stir for a minute or so. Add the Wine by pouring around the pan. Stir and stir. Turn the heat down to Medium Low. You want steam to be rising but you do not want bubbling or steaming. This is the easy and comfort method of doing this. There is no tossing or throwing impossible heights out of the pot. No. Just stir and stir. When most of the wine is absorbed, add 1 ladle of Broth. Stir and stir. Add the Rosemary, Thyme and Oregano, whole sprigs. You will need to play with the heat to keep it at the low level you want. When most of the Broth is absorbed, add another ladle. When is that? When you can draw a mote or line down the middle of your pan and the liquid and rice does not close up on itself immediately. Stir and stir. Repeat. At around 30-35 minutes, test the rice. If it is nearly there, then proceed to the next step. Otherwise continue adding broth. You may need more broth or you may need less. Nearly there means it feels tender yet still a little bite. It is not hard in the middle and sticks impossibly in the crevasses of your molars. I like it softer than D but not mushy. Remove the Rosemary, Thyme and Oregano sprigs. Add the mushrooms back and add the Peas and Basil. Add 1 ladle of broth and stir and stir until absorbed. Add the Parmesan and incorporate well. Spread the Risotto evenly out in the pan. Add 1/2-1 ladle of broth on top. Add the Butter in pieces over the top. Cover and set aside for 10 minutes. We do not have a cover big enough for our large pan so we use our large wok. Serve with additional Parmesan on top. Add optional chopped Parsley and a drizzle of Truffle oil. One of Vancouver's gems come crowded hotspots is Bin 941. It is so popular that Gord Martin opened a second one, Bin 942 across the bridge on Granville and Broadway. While the first one could genuinely be the eclectic cave it is with mis matched tables and chairs, random artwork on the walls and bits of bar detritus if not for the fact that it was twinned in the second. It makes both feel a bit like an out of the box set up. There are loads of out of box Pubs in England. They're mostly owned by the major brewers and identical from pub to pub down to the same cricket photos or old coasters on the exact same wooden pillars. Well, Gord is a local boy so I try to pretend the twin doesn't exist when I'm in the other. Whichever twin you chose to go to, they are both equally cozy. That coupled with the popularity means you will wait. Oh, to up that situation yet equalling the playing field, they do not take reservations. It is first come first serve. They open at five and that will be the only time you will not wait. We've waited upto an hour. There are about 4 stools in the small hallway in the back near the bathroom so we prefer to go up the road for a drink until they ring us. Today however, we were both able to leave work early enough to beat the rush but just. We met there for quarter to six and got the last table. Yay! Bin 941's concept is tapas but more accurately, small plates and on the small side as well. I used to live in Spain and feel that word is used rather fast and loose in North American fusion restaurants. Their menu has several of these small plates, as well as well as Mussels served with gorgeous toasted baguette, and Salads. The mussels and salads are more substantial but still small plate sized. I was not in a Mussel mood so we ordered three hot small plates, the Spinach Salad and Pommes Frites. We ordered one Small plate each and shared one. D was in the mood for Lamb. So I ordered the Fresh Pacific Halibut, pan seared on a bed of greens in a thai curry coconut sauce with a side of Mango and Prawn Sunomono salad. D ordered the Grilled Lamb Chops with a lemon roast potato and sides of a Spanakopita on Tzatziki, Minced Greek Salad on Feta and a fried Olive. Our third hot plate was the Crab Cakes with burnt Orange sauce, Bok Choy with chipotle Oil, minced Cucumber salsa. We shared the Spinach Salad with Baby Golden and Red Beets and Fried Saganaki (cheese) nuggets in a Sherry Vinagrette and their signature shoe string Pommes Frites tossed in Pepper and drizzled in Balsamic reduction. Now to start with the Pommes Frites. They are an item of great debate from posts I have seen so let me chime in. It depends. Yup. There's definitive for you. What I mean is they are messy, no doubt. The yummy Balsamic Reduction which is thankfully drizzled throughout and not just on top, is sticky and gooey. It comes in a heaping, glorious mound. So, if I were on an early stage date, I would not recommend you order these. You will be too self conscious and not fully enjoy them. As well, you'll be chatting very carefully and daintily eating slowly so they may may get cold. I love them. I ate them with my clean fingers, one at a time in rapid succession while D took them by hunky forkfulls while we comfortably talked. They were wonderfully dressed and piping hot throughout. The Spinach Salad was delicious. It was the first time we ordered a salad there. We have ordered may of their other Bruscetta in that part of the menu but never a salad. The Beets were sweet and tender. The mushrooms added nice depth and meatiness. The dressing was very well balanced and the greens well dressed. The four little bites of fried Cheese made the Salad feel a teeny weeny bit indulgent. I will have this again. The Crab Cakes were great but we had mixed reviews on this. D said his was dry. Granted, they come stacked on the plate and he took the top one so I had the one sat in the Orange Sauce so I did not find them dry. They were incredibly piping hot. I was so pleased about that. I did not care for the Burnt Orange sauce. It was more or less like runny Marmalade. The dish was served on a long plate and the Orange sauce was on one end and the Chipotle Oil on the Bok Choy was on the other. It seemed unnecessary to have two, particularly since the Chipotle oil was so fantastic and did not play well with the orange marmalade. The Cucumber salad bore a startling resemblance to the Greek Salad that D got later with his Lamb. Maybe because it was the same salad. I did not see any Tobiko as stated on the menu. I did not miss it. The Cucumber Salad had a fine fine mince which gave it a nice texture. The only annoying thing about the concept is that they assume you are sharing all your plates and assume that the people at the table, even if there are only two, both eat meat. Though we made it clear, though did not explicitly state it, that the lamb was for D and the Halibut for me, D had to sit and watch me eat my Halibut. The attentive servers came by a couple of times and had to have noticed that D was not partaking and waiting. The Halibut was cooked perfectly and the Greens were nice but the sauce was quite under seasoned and for such a vibrant style as the Coconut Curry, it was rather mild, near bland. Temperature was great. Hard to hit without overcooking the Halibut. The Sunomono was a miss for me too. The noodles were too al dente and there was not enough Mango which was what I thought would be the highlight of the dish. I do not think I would order this again. It was fairly blah. D's Lamb Chop dish was aesthetically pleasing well except for the Spanakopita sat in a puddle of Tsatziki. Don't mistake me, it was a nice Spanakopita and the sauce was good but it seemed out of place on that plate. As I've said, the Greek Salad that came with the dish was actually the Cucumber Salsa we had with the Crab Cakes or alot like it, pressed on to some feta. It was yum. D thought the lamb chops were under seasoned and under flavoured, given the theme of the plate, they were surprisingly plain. They were cooked wonderfully rare and had a great texture but, as D put it, unusually unlamby. I guess that is a bad thing. He said it was. The lambiness is why your order Lamb. Total experiment. A had a couple of nay sayers on this combo and I had my doubts. When I got home, I immediately went to the fridge and put a Blueberry in my mouth with a Caper. I wasn't convinced so I tried again. It was quite nice. I did not want to risk it on a larger scale so I really used very little caper but I liked the little salty, sour kick. Now, the experiment was not an whole success. The Relish/Sauce did not really compliment the Ling Cod. I cannot pinpoint why. It's kind of like the way I feel about clash beween Tinned Tuna and Cucumber. It just did not go well. Well, this was nicer than that. It was not offensive but it did not sing. I think it would have done better on Salmon. Next time! In a small nonstick pan or sauce pan, melt the Butter on Medium heat. Sautee until browned. It will take about 8-10 minutes. Add the sugar toward the end. Add the Blueberries, Lime Juice and Balsamic. Gently simmer for 10 minutes. Pan friend in Butter and Olive Oil, 4 minutes on Medium High heat on each side for 1 inch steak. My favourite comfort cooking activity is making Bread. If there is no express reason for rushing in the morning on the weekend, I like to bake. Actually, I started these rolls Saturday afternoon to bring to my friend's BBQ but I got distracted and ran out of time for the second rising. No matter. They had loads of food and I had slow risen rolls for breakfast so win win win! In a mixing bowl or your Stand Mixer bowl, add the Warm Water, Honey and Yeast. You want the water quite warm but not too hot so as to kill the Yeast. You can microwave the water for 30-40 s. If you can comfortably leave your finger in the water, it should be okay. Let sit for 10 minutes until foamy like a Capuccino. You can do all of this by hand. For the first few steps you should use a Wooden Spoon. When I get to the part where you are KNEADING, you have to take off your rings, wash your hands and get in there. You'll need a clean, floured surface to work. This is why I now only use the mixer. When I'm at mom and dad's, there is alot more room to do this. It is just more convenient and cleaner in a Vancouver sized townhouse to use the one bowl. I'll still knead a bit in the bowl at the VERY end before proofing to feel more involved. Add the Salt to the Wine and swirl. Add the Wine, Herbs, Baking Soda and Oil to the mixing bowl. Turn the mixer on 'Stir', lowest setting. Add the flour 1/2 c at a time with the mixer on 2 or second to lowest setting. You may need a little more or little less but wait and see depending on the moisture of your house and flour. So add all but the last 1/2 c of flour until you see how sticky it is. At this point if you are doing this by hand, this is when you take it out of the bowl and put it on a floured surface. It won't necessarily be in ball form but it will be WAY too stiff to you to work with a spoon without breaking your spoon. Let it run for a few minutes until it all becomes incorporated. Be patient, it will happen. 3-5 minutes. Feel the dough. If it still looks sticky, at more flour 1 Tablespoon at a time. You want it to have some give and for it to be a tacky just not pasty. So do not add much more than a 1/4 c extra. You are now kneading. Let machine run on 2 or second to lowest with a couple of jolts on '4'. When the ball climbs to hook, stop the machine and pull it off. Let this go for 8-10 minutes for nice chewy bread. Kneading by hand, once it is in ball-form means holding the ball with both hands, pushing it away from you with the heel of your palm. Fold in half along the long edge of the shape and repeat over and over. Gently press down the dough and knead with the heel of your palm in the bowl for a few turns. My dough weighed about 560-570 g so I made 8 balls of 70-72 g. Form each ball and set aside. Lightly Oil a loaf pan. Take each ball of Dough and rub with Oil and place in the loaf pan. Set aside to rise covered in a warm place for an hour minimum. Or if you are not eating them straight away, cover with plastic wrap or a flat lid in the refridgerator overnight. If you are refriderating, bring out of the fridge 30 minutes before baking. Preheat the oven to 400F. Place in the middle of the oven for 35-40 minutes. Let cool on a rack briefly then cover. If you leave it in the pan, it will sweat and get soggy. But if you let it sit out to cool too long it will dry out. But you will eat them right away slathered in Butter! I made Poached Eggs (my Perfect Poached Egg post is here) and made little sandwiches with Arugula and Dijon Mustard. I am all about the tray for grilling now. I know it might be my grill or temperature but my fish has been sticking so after my friend's BBQ a couple of weeks ago where he had the Salmon-a-thon, I have starting using foil trays in the grill for more delicate fish, particularly with a marinade. I am taking this to a BBQ so I formed the tray that would fit neatly into a plastic container with a lid. Lightly oil the foil. Place the fish inside. Spoon on the sauce and let sit until you're ready to grill. Simply lift the foil tray out of the container and place on the grill. Place on the hot grill for 10 minutes with lid down. Sooooo good. It was on the spicy side so you could cut the Soy Chili in half if you want. Our friends were having a craft making session for their wedding. It was fun! I used to love watching Martha Stewart years and years ago so it was like a real life session with that squeaky voiced girl who does all the wedding crafts. She's slightly annoying but a wedding craft genious. I think she's still with the show. Anyhoo, P did all the grilling and prep work. To nosh on while we rested post, crafting, he made us some nibbles of Heirloom Tomatoes, Blue Cheese and Basil. I have never tried that before. You normally think of using fresh Mozzarella or so I was more pleasantly surprised. I am definitely trying this again at home! He made some wonderful Salads from garden Veg from the neighbour. I don't have such generous neighbours.... but we don't have back yards either :^P. We roasted some AMAZING potatoes they bought at the Trout Lake Farmer's market that advertised that they tasted like they were already buttered. No lie. They were YUMMO! and of course, 'tis that time of year that the corn from the 'Wack' starts coming in. My Asian themed fish I brought did not go as well as the burgers but I don't care. Everything was delicious! D actually made these Crepes last week but it was on a day where we cooked three meals and I baked so I am spreading some of the action around. Clearly it is not from today since it is a 'school' day and I might be above average on the food crazies but Crepes on a Thursday with homemade compote is not gonna happen for a few more decades. Now this is complicated so watch out. Put that stuff in a small pot and bring it to a boil. Turn off heat and cover and set aside. That's it. If you want it thicker, you could slurry 1/2 t of Corn Starch with the Water and add it but we did not want it gloopy or too too jam like. It works out well since D is out of town for work and I am having Brussel Sprouts as a treat. I like Brussel Sprouts in any form but I particularly like fresh ones. Still not much of a post.... or is it? People have this thing about Brussel Sprouts that I think they need to just shed and work through like quitting smoking. We have it programmed in from childhood when we identified bitter tastes with poisonous alkalis at a primordial level that Sprouts are bad. Well, there's that and that people really do not take the short time necessary to make them taste good. Sure if you boil something to heck and back, it is going to taste like it. There are ways of eliminating those bitter flavours and roasting or frying are two of the best ways. The easiest way to learn to love them again is to try not to over cook them first and foremost. If you steam them, treat them like Broccoli, stop the cooking when they go day-glo green. You'll see! It does not take long. D hates Brussel Sprouts. He reluctantly puts up with it but it is much easier for him when I eat them when he is away, :^P. This won't be my whole meal but probably a big part of it. Wash and trim the stem ends of each Sprout and remove any old outter leaves. Slice the Sprouts in half. I made the daft mistake of slicing in half after and nearly burned all my fingers. In a small sauce pan, bring 1/2 inch of water to a boil and place the Sprouts in a steamer basket in the pot and cover. Steam for 4 minutes. Or with a sprinkle the Sprouts with water and microwave in a bowl for 2-3 minutes. In a non stick pan, heat the Olive Oil on Medium High heat. Place all the Sprouts in the pan cut side down and spread out. Let sizzle for at least 2-3 minutes before turning. Shimmy the pan around but no flipping. Let them brown and crisp up. Flip each one or just toss around randomly. My cousin's wedding was last night. It was a beautiful ceremony in an enviablie location. We were taking in the nuptials with the breathtaking background of the Toronto skyline. Yet despite the late night we returned home, mom was still up bright and early waiting for us to wake up so she could make us breakfast. Separate the Egg Whites. Beat briefly only to bring some uniformity to the mix. In a non stick pan on Medium Low Heat, heat some Olive Oil or Butter. Sautee the Vegetables for 3-5 minutes until softened. Set aside. In the same pan, add some more Oil or Butter, Add the Egg Whites. Move around like you're straightening out a Table Cloth. When it is mostly solidified and less jiggly, flip. Add the Vegetables and Cheese. Let heat through for 1 minute. Fold out on to a plate and serve. Bacon and Asparagus are a weekend staple. There is no bacon on my plate but Mom does have the technique for flat, crispy Bacon down to a science. She lays them out on a rack with a pan underneath and puts on the low broiler. She used to also microwave them wrapped in layers of paper towels. She's decided they become much crispier under the broiler. We are flying home after three weeks today. Well 1 weekend in Toronto and the rest in the Galapagos. Mom made us Kimchee Chigae for Dinner. It is traditionally a Winter dish but she knows it to be one of my favourite so she made it specially for me. Plus, generally nowadays, most households have the 'Mature Kimchee' you need to make Kimchee Chigae. Mature Kimchee means that it has picked and become quite sour. Afterall, before the arrival of Columbus and he Chili from the New World, Kimchee was probably alot more similar to Sauerkraut than it is to its present form. Back in the day, before the common availability of refridgerators and NOW Kimchee refridgerators, people fermented or stored their Kimchee in earthen pots buried in then ground. You would normally make loads during the summer when the Cabbage was in season so by the Winter, the Kimchee was quite ripe. As well, Korean like many cultures derived many of their signature dishes through peasantry and necessity. You stretch what you have. Now, with the addition of Tofu and Pork ribs, it's not quite the Peasant stew it used to be. One thing you should be aware of is that Store Bought Kimchee will not age like the homemade stuff. It lacks some pretty key ingredients so it will spoil rather quickly too. That is why your fridge smells after a week whereas my Mom's fridge never ever smells. Traditionally, Kimchee Chigae is made from a Pork broth with simple Aromatics, loads of Kimchee, Gochu-Cadroo (Korean Chili Powder) and Dubu (Tofu). Mom has made adjustments over the years, because V, my sister and I became Vegetarian nearly 20 years ago. Now, Mom's Kimchee Chigae uses Milchee Mul (Korean Fish Broth) which is somewhat similar to Dashi. It is a light broth based in dried Anchovies and sometimes, Kombu. As well, she adds Mushrooms for some girth. She tried a less successful Enoki Mushroom experiment which does NOT work well in Kimchee Chigae. Mom's Kimchee Chigae served. There is no heat source! She still uses Dubu but now and for several years, she uses Organic Fresh Dubu. A friend of hers has a Dubu House. They make fresh Tofu daily. It is incredibly delicate and similar to 'Silken' Tofu and only keeps in the fridge for a few days. And of course, quite alot of Mature Kimchee is essential. This Christmas, I will watch Mom end to end. She normally starts the Milchee Mul 3 hours in advance so I have not done it yet. But that said I wanted to share this video. Kimchee Chigae is cooked and broth to the table bubbling. I went out with the 'Ladies who Wine' aka some girls I used to work with a few years ago. Besides a similar attitude to work and life balance, we also share a passion for Food and Wine so we like to catch up on gossip over a nice meal every once in a while. Faux Bourgeois has been on our list for a while and we had decided we were probably spending too much time in Kits. It had been receiving consistently strong reviews in publications and from friends. Yet it's in a most unexpected location in the Kingsway area of town where the few restaurants peppered in the somewhat tumbleweed suburban area are normally Asian. Actually, if you are heading Eastbound and you are not paying attention, you will miss it. It is offset from Kingsway so if you hit Fraser, you have gone too far. Once we'd managed to find our way there, we arrived to find it packed. It was a Wednesday and it had two full seatings. Amazing. I was a bit worried at first when I strode up carrying my bicycle helmet in evening casual to find two couples in cocktail dresses and suits. I needn't be. It was kitsch and homey enough that it did not matter. We started with a nice bubbly. K always seems to like to start with sparkles. We had a bottle of Moumousseau Cuvee JM. It was light and crisp, a tad tart. We had a variety of starters and it complemented all of them and a thorough chat. I ordered the classic Escargot in Butter with Garlic. K and J ordered Tartes Flambee which are open faced tarts on puff pastry. K had the Florentine and J the Alsacienne. The Tartes were equally popular. I will admit that I thought the square cut puff pastry made them look somewhat like toaster pastries. We have had Tartes Flambees at DB a bit more free form though more scarcely dressed. Geometry aside, the toppings were abundant. If you like bacon, I would recommend the Alsacienne. The nom-nom's from my friends told me that I need to try the Tarts next time if I can tear myself away from call of the Caracols. The Florenine was heaping with Spinach and drizzled with a nice Tapinade dressing. As a main, I ordered the special, Bouillabaise, Seafood Stew. K had the Duck Confit and J the Roasted Lamb Sirloin. To continue with our meal, we ordered an Oregon Pinot Noir, Argyle. I had assumed my Bouillabaise would have a tomato base. It did not. Still it was hearty enough to play with the Pinot. I asked what the white squiggly lines on her Lamb where as I was doubtful. She said it was a Horseradish Dresssing and it complimented the nicely done Lamb well despite the questionable aesthetics. As for the duck, it is the dish that they are most noted for and though K did not say outright, her empty plate spoke volumes. I'll have her write a comment. Overall, I was quite pleased with the overall experience. I'd like to see more French wines at different price points to help on that difficult decision when red and white meats are on the same table. Given the area, it is a destination and it is worth the visit. A definite Gem on the East 'sayeed'. Ambience: modern Parisien bistro, low lit. Can be romantic or fun for friends. Tuesday, Aug 17th - Bowl of Stars - Concept change to "build your own"
I used to like this place. It is one of the few places near the office that has lunch priced food with decent options. The majority of the menu was in Chinese and the English translations were of little help because they did little to distinguish one dish from the next. Perfect. You needed the server to explain. Loved it. They had a great Indonesian style noodle bowl that I ordered a few times. Well, while I was away and then not eating out at lunch, they apparently had a flood and closed down for a month. They re opened recently to a whole new concept. One, I fear, will spell their ultimate demise or unexpected success. I predict the former. Instead of the magazine thick menu with photographs and dozen asian styles of dishes, they now have two basic options: Soup Bowl or Stir Fry Bowl. Each Bowl costs $5.99 to start. With a Bowl order you pick your 1. Sauce, 2. Starch from 5 different types of Noodles or Rice and 3. two Protein or Veg ingredients. The dish comes with some additional Veg, mainly Scallions and Beansprouts added. It is very precarious to assume that a customer will know if a Korean BBQ sauce should be ordered with Black Fungus and Pork Belly on Udon Noodles is a good choice... or Satay Sauce with Tofu Puffs and Pork Intestines on Rice is a better option. I foresee many inconceived concotions being ordered and returned... or worse, forced down for fear of reprisal. I wish I knew which combination of Noodle, Sauce, Protein to pick to get my original preferred order of Hot Indonesian Noodle soup. 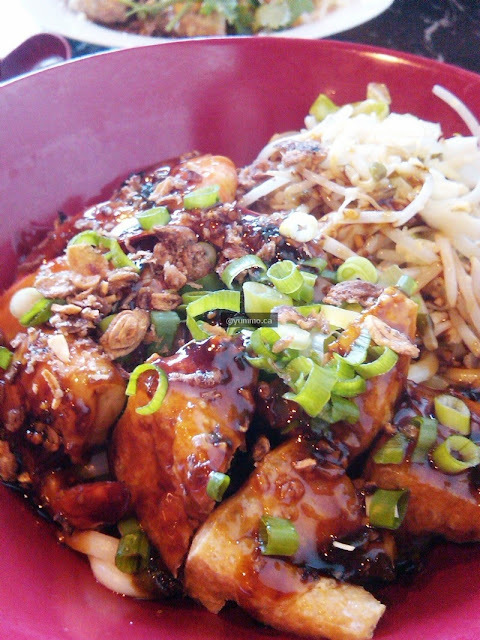 Today, I ordered Udon Noodles in Satay Sauce with Prawn and Tofu Puff. My colleague chose double Chicken with Curry on Rice. He chose that because he could not figure out what was meant to go with Chicken. He came pretty close to ordering Kimchee in there. I advised him not to. The Curry was fairly run of the mill with the odd garnish of Coconut Flakes. My Satay was INCREDIBLY salty, aka a Black Bean sauce but I did not have the time nor energy to send it back. The Prawn were in shell. Not a good work option. I would never order that again. I am really disappointed. What will I do out here in the culinary desert that is Joyce Collingwood?